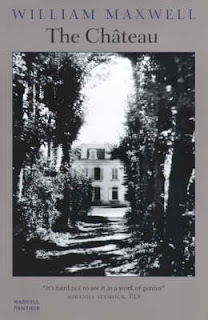 "THE CHATEAU by WILLIAM MAXWELL was first published in 1961 and, along with many of Maxwell's novels, was reissued by Harvill Press in the 1990s. The book tells the story of a wealthy young American couple visiting France in 1945. It is a beautifully detailed portrait of the young couple and their never perfectly comfortable relationships with the French people they meet - as well as a picture, filtered through a cleverly indirect lens, of a country and people emerging from the ravages of war."